This is the program that distinguished us from all others over a decade ago – an 8-day outdoor adventure study of eight ecosystems. Not only was this the first trip our company ever offered, it continues to be one of the most popular. The caliber of education on this trip is so high that teachers completing the course have been awarded credits by American universities. 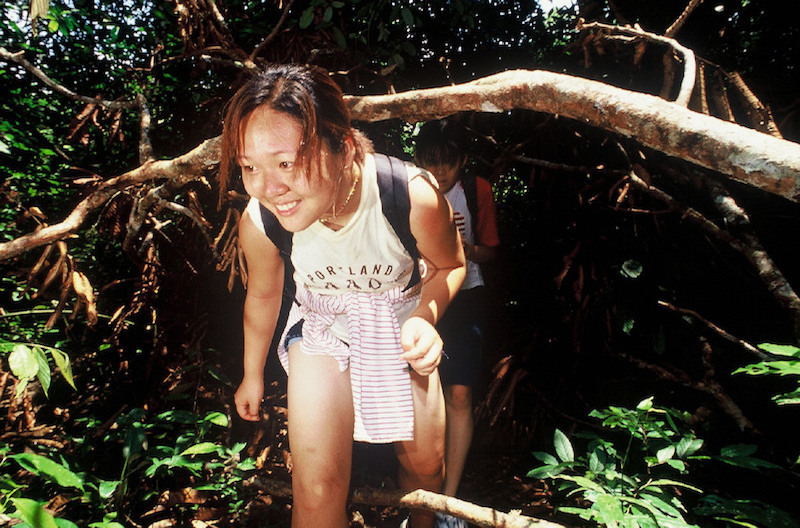 Reefs to Rainforests combines fun and excitement with hands-on learning experiences in the study of: tropical evergreen forests, karsts and caves, freshwater wetlands, montane forest, coral reefs, intertidal zones, mangrove forests, and rivers & streams. Few other areas in the world offer such diverse ecosystems in such close proximity to one another. 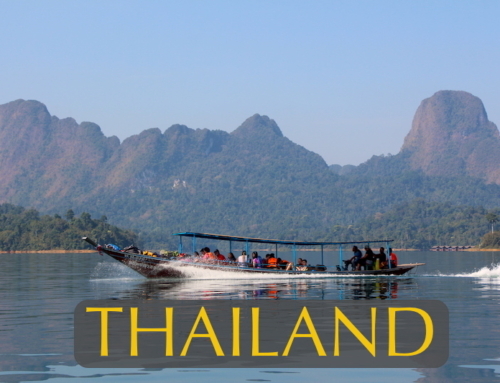 Located on the narrow Thai/Malay Peninsula with the coral reefs and offshore islands of The Andaman Sea to the West and the rich wetlands of The Gulf of Thailand to the East, Southern Thailand is uniquely suited for this program with a minimum of travel time between destinations. But there is a lot more to this trip than nature study. Our Thai staff will totally charm students while immersing them in Thai culture through the Kingdom’s iconic cuisine, songs, dances, ceremonies, games and shadow puppet plays. Most importantly, participants will bond closely with their designated Thai ‘brother’ or ‘sister.’ Unlike the vast majority of tourists to Thailand that only know Thais as servants at their hotels and resorts, students and adults on this trip will get to know the genuine warmth of the Kingdom and leave with a friend for life. After arrival at Phuket International Airport we transfer 2.5-hours to the shores of the Cheow Lan Reservoir and Khao Sok National Park, part of the largest protected wilderness between Bangkok and Singapore. Arriving at Klong Krat Raft House, our accommodation for two nights, we will enjoy a delicious lunch and have time to swim in the lake and to practice kayaking. Later in the afternoon, students will travel by boat a short distance to a trailhead that leads them on a hike to through prime wildlife habitat. Along the way there is a good chance of spotting wild pigs, barking deer, mouse deer and snakes. At the end of the trail, students will be able to explore a large cave with beautiful limestone formations. Dinner will be followed by stories and games around a campfire and a candle light sharing-circle to reflect back on our day’s adventures together. Right after breakfast this morning we set off by boat to the far reaches of the lake and the beginning of a trailhead that leads us through a tropical evergreen forest to Namtaloo Cave. The 4-hour (round trip) forest hike provides many opportunities to stop and learn about the fascinating and complex relationships in this, the oldest terrestrial ecosystem. 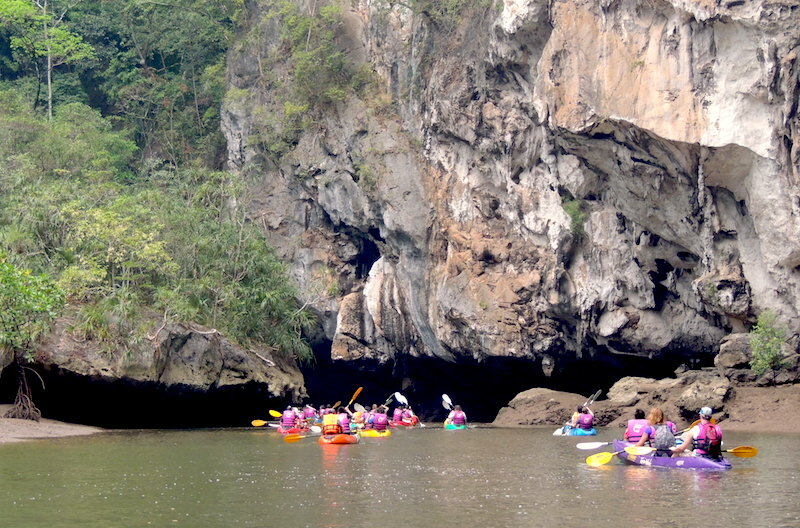 As we enter the 500-meter long Namtaloo Cave passage, lessons in cave fauna will become the focus. Many species of insectivorous bats, cave spiders, cave crickets, cave toads, fish, crabs and river prawns make this an exceptionally rich cave for study. If water levels allow for safe passage all the way through the cave, students will have a real-life Indiana Jones adventure as they negotiate the dark passage through cold underground river pools, over ledges and through narrow passageways. 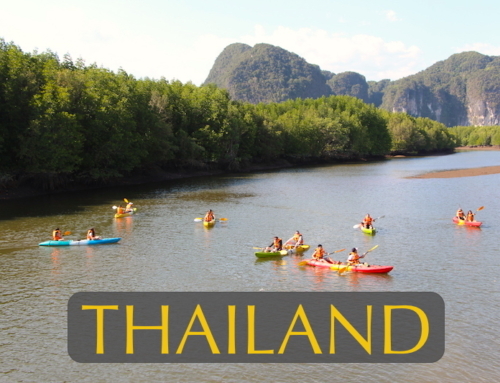 After the hike, we will return to Klong Krat Raft House and take the afternoon to clean up, swim and enjoy kayaking. After dinner back at our raft house students will have a short lecture on nocturnal animals before boarding long-tail boats equipped with powerful spotlights for a Night Safari along the shores. Animals that might be spotted include: civets, otters, slow loris, tapir, Asian elephant, barking deer, mouse deer, owls and nightjars. Even on nights when wildlife viewing is not particularly good everyone can enjoy the wonderful night sounds and learn about stars and constellations in the brilliant night sky. Students rise at first light to enjoy the sunrise and some light snacks. At dawn we have a short lecture on the importance of “keystone species” before boarding boats for our “Dawn Safari”. 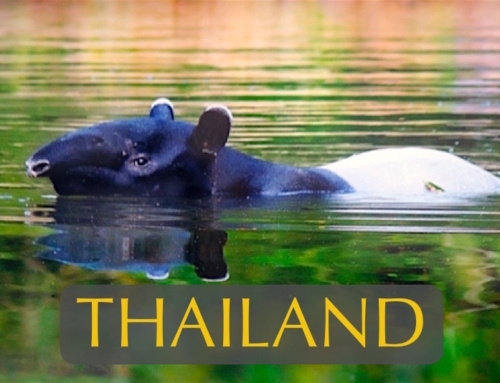 Early morning hours give us the best chance to see Khao Sok’s wildlife at the time of day animals are most active. 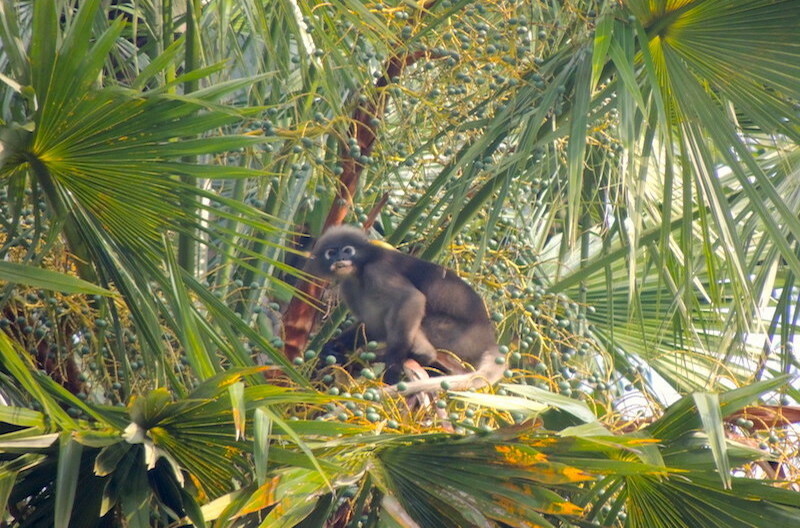 As part of an on-going research program, students will be involved in spotting, mapping and recording the park’s “keystone species” (gibbons and hornbills) that are critical to seed dispersal in the forest. This baseline data is important in monitoring the impacts of poaching on the park’s wildlife. A great range of other wildlife may be encountered at this time of day: dusky and silver langurs, long-tail and pig-tail macaques, wild pig, jungle fowl, osprey, sea eagles, and other animals. Returning to the raft house everyone enjoys breakfast, packs up and heads back across the reservoir by long-tail boat to our waiting mini vans. It’s a 3-hour drive from Khao Sok to Trang province. Along the way we will stop for a pizza lunch in Krabi Town. Arriving on the Andaman Coast by late afternoon, we will check in to our beachside resort. If the tide is low we will set off to explore the inter-tidal zone. Here students will have hands on lessons in the animals that make up this fascinating realm: hermit crabs, sand bubbling crabs, starfish, clams, sand dollars, anemones, snails, sea cucumbers and more. If the tide is high we will enjoy games on the beach. After our meal, student teams will entertain one another with traditional southern Thai shadow puppet theater. We’re up with the sunrise for a fun day at sea. Right after breakfast we drive a short distance to a pier where we board our charter boat for a full day of island hopping, swimming and snorkeling. The islands of Koh Kradan and Koh Hai offer excellent reefs for diving with hard and soft corals and reef fish in profusion. Koh Muk is an island with a hidden “hong”, a limestone walled paradise set in the middle of the island that can only be accessed by swimming through a long sea tunnel in total darkness. It is a thrilling experience! Lunch will be served aboard our boat as well as soft drinks, tropical fruits and Trang’s famous cakes throughout the day. Each student will be challenged this day to study a coral reef creature and report on their findings to the entire group later that evening. Oral reports that are judged good by the student assembly will make the presenter eligible to select a colorful pair of Thai fisherman pants (Tangkaews). Returning to our resort in the late afternoon, there will be time to enjoy some group games on the beach and another amazing sunset before dinner. Following dinner, students will present their marine reports and have time to catch up on their trip journals. 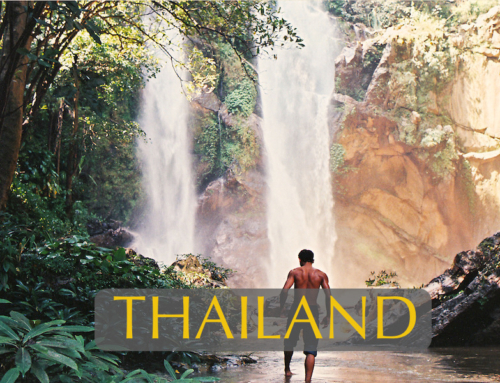 After enjoying a leisurely breakfast, we pack up and set off by mini vans (1-hour) to a beautiful waterfall that flows from the forested mountains in the middle of the Thai/Malay Peninsula. 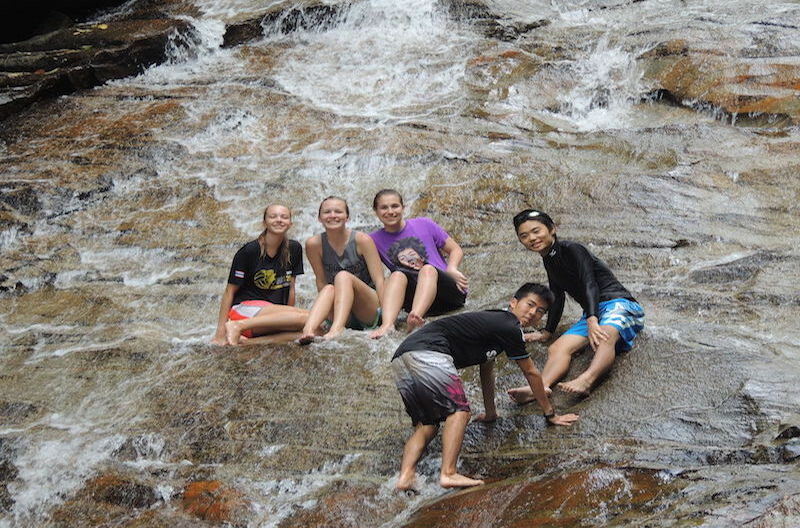 Climbing through the lush forest to the waterfall offers opportunities for students to see quite different vegetation and much closer to a true lowland rainforest from the “tropical evergreen forest” they learned about at Khao Sok. Students can swim in the large pool at the base of the falls and investigate the many species of frogs, ferns and mosses that make up this perpetually wet micro clime. Returning back down the mountainside, we will stop to conduct a biotic and abiotic analysis of the stream. Separating into biotic and abiotic research teams, some students will set out to investigate life in the riparian zone and conduct a study of stream invertebrates. Armed with dip nets, invertebrate charts and collecting trays, these students will challenge one another to see which can collect and properly identify the most macro invertebrates. It’s a fun as well as educational exercise. For the abiotic analysis, other students will determine the stream’s rate of flow, turbidity, temperature, level of dissolved oxygen, pH and do a chemical analysis that determines the presence of ammonia, phosphates and nitrates in the water. Student research groups will share their findings with one another and compare them with a water sample taken from a canal running through Phuket town, to see how humans impact on waterways. 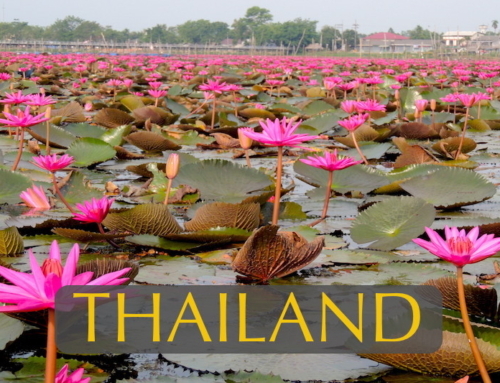 Following a picnic lunch, we will drive to Phathalung Province on the Gulf of Thailand side of the Thai/Malay Peninsula and check in to a wildlife sanctuary lodge on the shores of Thale Noi – Thailand’s famous fresh water wetlands. After dinner, we will share thoughts on our trip thus far in a group candle circle. 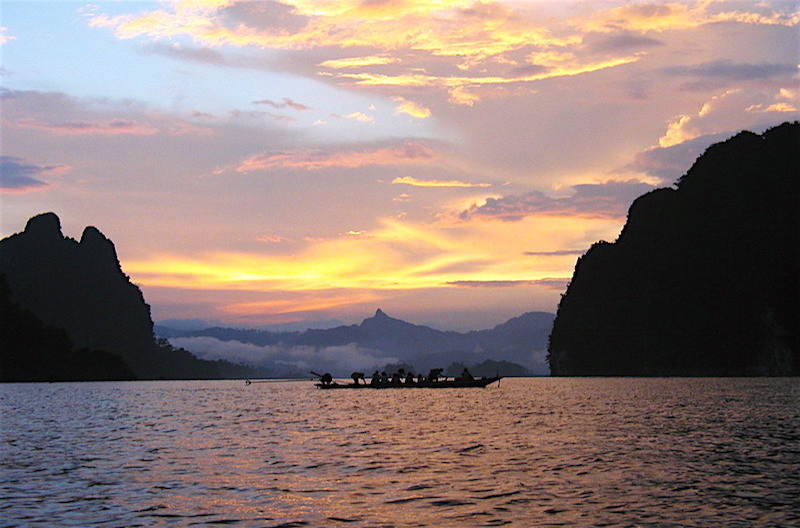 At first light we set off by boats across the magical waters of Thale Noi. This “little lake” has been declared a Ramsar Site – a wetland of global significance for the amazing concentration of water birds found here. 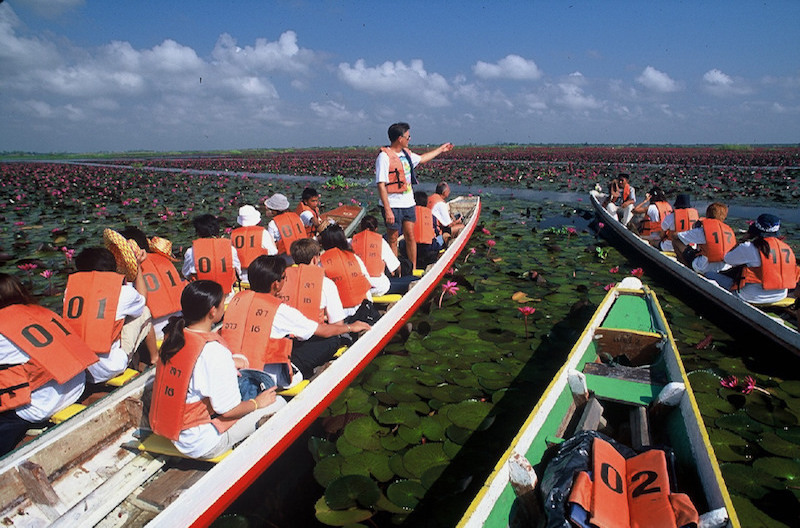 It also boasts one of the largest expanses of water lilies in the world that only in bloom in the early morning hours. November to April are the peak months for winter migrants at Thale Noi so students should see a great diversity of bird life, including: four species of egrets, two species of cormorants, whistling ducks, pygmy geese, purple herons, yellow bitterns, black-winged stilts, jacanas, purple swamp hens, moor hens, terns, swallows, storks, kingfishers, ospreys, kites and sea eagles. 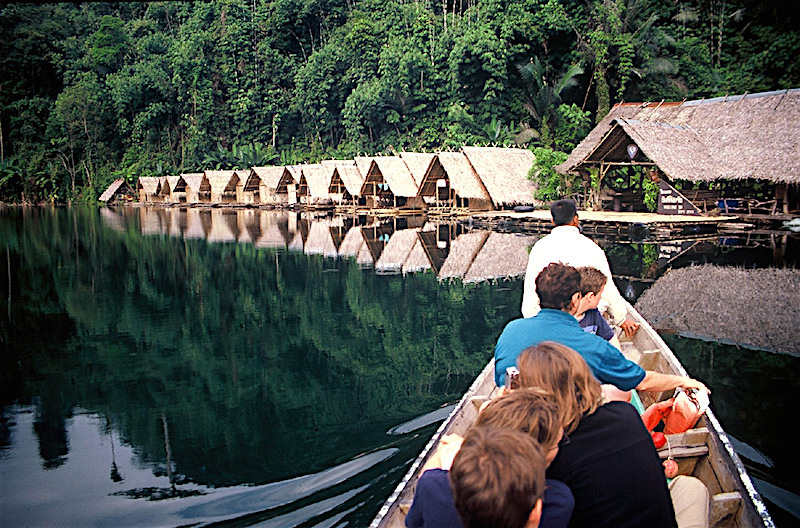 Following a boat tour of the lake, students will return to our lodge for breakfast and then have a chance to purchase some local handicrafts made from lake reeds by local villagers. Departing Thale Noi along a back road, we will stop to experience one of the oldest fishing methods still in use in Asia. Huge nets are lowered and raised from the waters of Tonle Sap – Thailand’s largest fresh water lagoon, using a counter lever system from a bamboo and pole scaffolding. Students can try their hand catching the tiny fish that are dried and added to a number of famous Thai dishes. They might be surprised to learn how much the locals make from this almost effortless enterprise. Our next stop is a Wildlife Breeding Center run by Thailand’s Wildlife Conservation Division where we will enjoy a picnic lunch. Here students can see many species of animals that were orphaned or confiscated from poachers and illegal pet owners that are being breed for reintroduction back into the wild. The center raises many species of pheasants and wild jungle fowl, sambar deer, barking deer, mouse deer, civets, leopard cats, tortoises and other animals. Just a short drive from the Wildlife Breeding Center we come to our nature lodge where we can clean up in preparation for our final night. After breakfast we transfer onto Krabi Province where we will have be taking part in a mangrove reforestation project and kayaking activity. 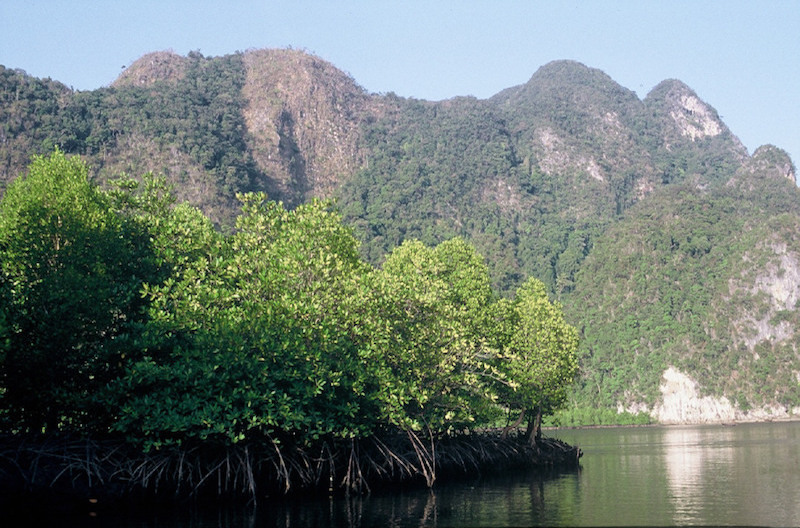 Mangrove forests are vital to the health of coastal fisheries; they also act as buffers protecting seaside communities from tsunamis, typhoons and storm surge. We will be replanting an area of mangroves that was cleared for the construction of a community pier. This is an important project as it increases the nursery areas for prawns, shrimp, crab and fish – foods necessary to feed Asia’s growing population. 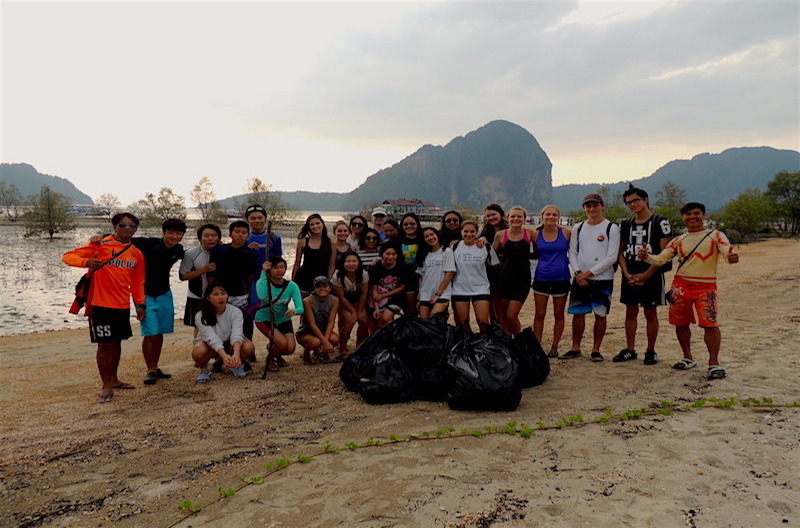 Students will receive an overview of mangrove ecology before partaking in a mangrove tree planting that not only gives students great pride and a sense of accomplishment, it offsets the carbon footprint of their trip. After getting muddy planting trees, students will be given basic canoe instructions before we set off paddling through complex mangrove channels, limestone tunnels and into hidden “hongs”. Along the way we will see large cliff faces with ancient pictographs painted on them where students can reflect on the Neolithic peoples that once lived here. We may have the good fortune to view wildlife along the way including several species of kingfishers and wading birds, grey herons, crab-eating macaques, langurs, otters, mudskippers and fiddler crabs. It’s just a short drive from the mangrove tree-planting site to our accommodation for the night where everyone can wash up for a poolside dinner party under the stars. Our final night together will be highlighted by a special dinner, Thai dancing (performed by the students), a fire show (performed by the staff) and the awarding of certificates of achievement to each student. A beautiful candle circle where each person shares their favorite memories of the trip will officially close the night and the program. After an early breakfast, students will be transferred by mini vans back to Phuket International Airport for departure.